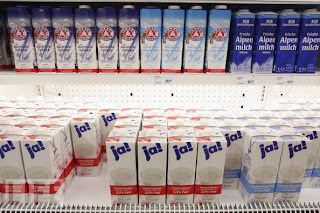 To Europe With Kids: Got Ja Milk? The four of us in our family are huge milk drinkers. Voluminous. The milkman delivers 5 ½ gallons to our doorstep every Tuesday, and sometimes I even have to run to the store for more on the weekend. Our taste for milk is a little bit of a predicament when we’re in Europe, though it’s becoming less difficult than it used to be. sold in plastic bags in Europe. 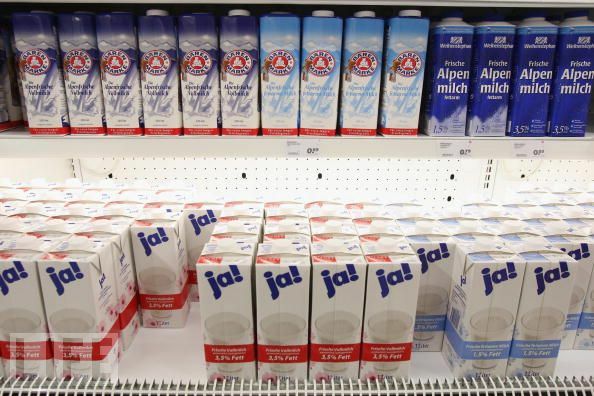 The only problem that still remains is the taste and availability of the milk in much of Europe. (I say much of Europe because I think the Belgians and Dutch, which we observed last summer, have it figured out now.) Commonly available at grocery stores is what my husband and I call, “Shelf milk.” Shelf milk is not refrigerated, ergo, it sits on the pantry shelf. It usually comes in a little one liter box, or, when I was young, a one liter plastic bag. Shelf milk does not need to be refrigerated because of an ultra high temperature pasteurization process, and this results in a distinctly different taste which we are not accustomed to. My kids can’t stand it. They call it “cheese milk” because of its somewhat bovine flavor. But like I said, the situation is slowly improving. Last summer we actually found a selection of refrigerated grocery store milk in whole, low-fat, and non-fat varieties in several countries! Some of the brands, however, still had residual cheesy flavor, but they were tolerable, at least, in a bowl of cereal. After a lot of sampling, we were delighted to find ja! milk, available in some of the larger supermarkets, which tastes darned close to what we're used to. It's progress! Ja!! ja! milk was definitely the best tasting we've found so far.